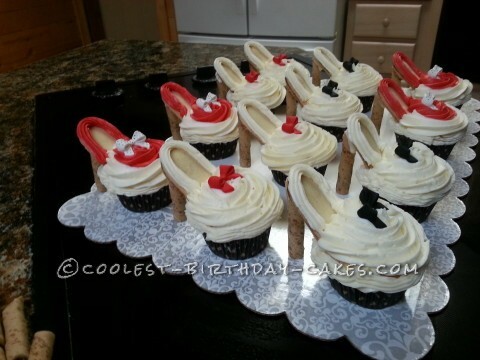 Talk about sassy…these little diva shoe cupcakes were something I had been wanting to try for ages!! One of my daughter’s coworkers was in need of some cute cupcakes fast. Luckily for me she had no plan and gave me free rein on the design. I had seen some of these a while back and originally thought I would be making them for a little sweetheart’s birthday. I had envisioned a Wizard of Oz theme and the cupcakes would be covered in red buttercream and rolled in red sparkly sugar….but not this time. Instead these turned out to be for an ‘all growed up’ sweetheart who was very deserving of a birthday surprise of her own. It is wonderful to have such thoughtful friends. The French vanilla cupcakes were topped with an extra helping of buttercream swirl and a premade candy bow. The sole of the shoe was a Milano chocolate filled cookie and the stiletto heel is a chocolate filled pirouette glued to the cookie with candy melts. These turned out so cute…..everyone said so!! But I haven’t given up on my ruby slippers yet….any takers?? ?